Chocolate n’ Nut Coated Cherries | Rosetta Bakes! Here’s a very easy recipe using cherries instead of strawberries. This is so easy you don’t even need a recipe, so I’ll just tell you how I made them. Drain cherries on paper towels and set aside. Finely chop pecans and place in a bowl. Melt chocolate chips or candy in microwave for 30 seconds. Remove from microwave and stir. Place back in microwave for another 30 seconds, remove and stir. Do this as many times as it takes to melt the candy and stir until smooth. I also melted white candy the same was as the chocolate. Dip each cherry (with stem) into chocolate or white chocolate. 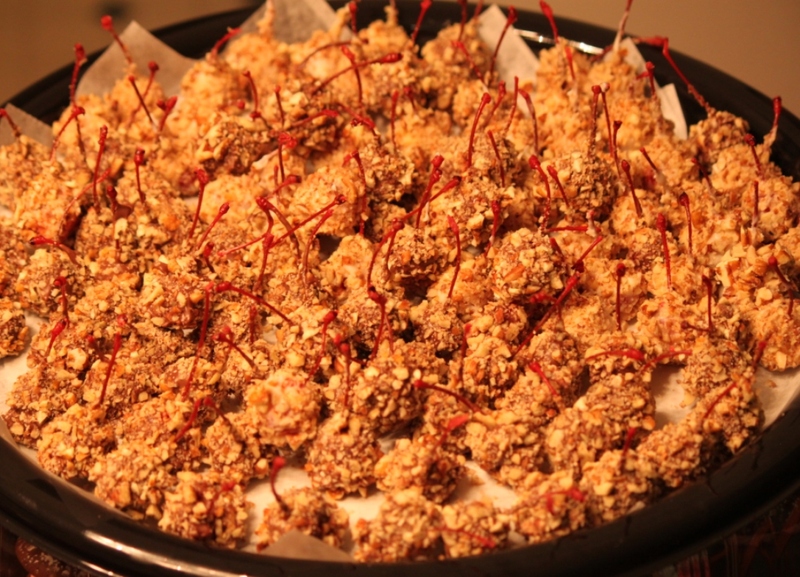 Immediately roll candy coated cherries into nuts and coat evenly. Place on a cookie sheet covered with foil until set.